The permitted variation from a given dimension. The limits of size are the two extreme sizes between which the actual size must lie, and the difference between them is the tolerance. (in machine building), the interval within which a numerical characteristic of a parameter is permitted to deviate from its nominal (rated) value. Tolerances are set for the geometric parameters of machine elements and machinery parts (linear and angular dimensions and the shape and positioning of surfaces) and for mechanical, physical, chemical, and other parameters (for example, electric resistance, hardness, and percentage of chemical elements in materials). Tolerances are indicated in the standards and technical specifications or on the drawings for manufactured objects in the form of two limit sizes (maximum and minimum), between which lies the actual size—that is, the size determined by measurement (Figure 1). Instead of limit sizes, technical specifications usually indicate the nominal size, which is obtained from structural design (strength and rigidity) calculations, taking into account the functional purpose of the product, and two limit deviations (upper and lower), which are equal to the algebraic difference of the maximum or minimum limit sizes and the nominal size, respectively. Thus, in the narrow sense of the word, tolerance is the difference between the maximum and minimum limit sizes or between the upper and lower deviations. For example, if the surface hardness of an element is given as 62-64 HRC, then the hardness tolerance is 2 HRC; if the size of an element is given as 60-0.1-0.1 mm, then the size tolerance is 0.2 mm. Any parameter value that lies within the given interval is permissible. The concept of tolerance is most widely used in the machine-building industry, where tolerances are established to ensure the necessary product quality and the interchangeability of machine parts or entire units. Tolerance defines the lev^l of precision required in the manufacture of parts. The choice of the method of working, the equipment, the monitoring systems, and ultimately, the production cost, depend on the tolerances. In practice there is no attempt to produce ideal parts, since it is not possible under industrial conditions and monitoring methods and is not required for proper machine performance. In addition to production tolerances, tolerances are also set for the change in the characteristics of products under operating conditions. All machine elements have fixed or movable joints with one another. The tolerance for mated members determines the nature of their connection—that is, greater or lesser freedom of their relative displacement or degree of resistance to relative displacement, or fit. A two-member joint consists of a female surface, generally called a hole, and a male surface, called a shaft. The fit is determined by the difference between the sizes of the hole and the shaft. The hole may be larger than the shaft; the difference between them is then called a positive allowance. If the shaft before the assembly of the members is larger than the hole, the difference is called a negative allowance. The actual positive or negative allowance must fall between the two limiting values, the maximum and minimum positive or negative allowances. The difference between the limiting positive or negative allowances is called the fit tolerance. There are three fit groups: running (loose), interference, and transition fits. Running (loose) fits are characterized by a guaranteed minimum positive allowance in the joint. This fit group also includes the so-called slide fits, in which the guaranteed positive allowance is equal to zero. As a rule positive allowance fits are used in movable joints and for facilitating the assembly of members in fixed joints. In the latter case the members undergo additional tightening. In joints such as a bearing journal rotating within a lining, the positive allowance ensures the necessary freedom of relative motion of the members. Negative-allowance fits are characterized by a guaranteed (minimum) negative allowance. They are used in fixed joints that transmit loads (axial force or torque), providing immobility—as a rule, without additional tightening of the members—caused by surface deformation. An example of such a fit is the joining of a gear to a steel or iron hub. A negative-allowance connection is made by a press or by heating the female member and cooling the male member. In transition fits, both positive and negative allowances may be produced. They are used for fixed joints when good relative centering and disconnection during assembly, inspections, and repairs are required (for example, the joint between the gear and shaft of a reducer). Members that transmit loads are usually fastened additionally by keys, pins, or bolts. The permissible deviation limits may be positive or negative, depending on the type of fit selected. In a graphic representation of tolerances and fits, the limiting deviations of the hole and shaft (positive upwards, negative downwards) may be laid out in an accepted scale from a line that arbitrarily represents the nominal size of a member or joint (the zero line). The zone between these lines is called the size tolerance zone (Figure 2). Comparison of the relative position of the tolerance zones makes it possible to determine the fit for a given joint. Fits and tolerances in the USSR are regulated by standards and are presented in the form of tables compiled on the basis of regularly constructed series of the limiting deviations of shafts and holes. The system of tolerances and fits reduces the total diversity of possible tolerances to the minimum meeting design and manufacturing requirements, thus creating the prerequisites for the standardization of articles, the reduction of the number of designations (such as reamers and gauges) of instruments and other industrial equipment and reducing the time required for planning and production preparation. 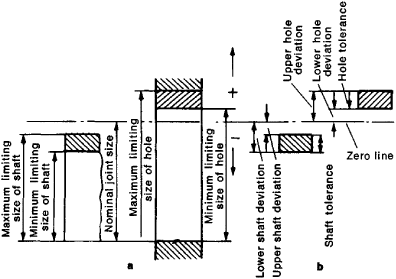 The tables of standard deviations are constructed according to basic-hole and basic-shaft systems. In a basic-hole system the main element is the part with the hole, and its nominal size and the deviations for all fits are the same. The fits are obtained by changing the limiting deviations of the shaft (the fitting member). In a basic-shaft system the shaft serves as the main element, and the part with the hole is the fitting member. The tolerance and fitting standards specify several grades of fit, in which the tolerance becomes larger with an increase of the nominal size in accordance with the so-called tolerance unit. In different grades of fit, the same size has different tolerances, which usually constitute a geometric progression with a denominator of 1.6. Tolerances and fits are designated on drawings and in technical specifications and COST (All-Union State Standard) by letters and numbers. For example, a plain-quality basic hole is designated A3, and the basic shaft for the same grade of fit is B3. On assembly drawings the fit is also indicated; for example, designates a plain-quality sliding-fit shaft joint (C3) with a rough-quality hole (A4). The aggregate of standard tolerance zones (limiting deviations) has been narrowed down to a reduced selection, which is recommended for the most important applications; such zones are called preferable zones. The standards establish tolerances and fits not only for cylindrical members but also for conical and threaded members, such as the key and splined joints of gear drives. Aparin, G. A., and I. E. Gorodetskii. Dopuski i tekhnicheskie izmereniia, 4th ed. Moscow, 1956. Priborostroenie i sredstva avtomatiki: Spravochnik, vol. 1. Moscow, 1963. Miagkov, V. D. Dopuski i posadki: Spravochnik, 4th ed. Moscow-Leningrad, 1966.
lakushev, A. I. Osnovy vzaimozameniaemosti i tekhnicheskie izmereniia, 2nd ed. Moscow, 1968. (remedy), limits that were established by a state on the gold standard for permissible deviations of the actual weight and fineness of a coin from the legal norm. As gold and silver coins circulated, they became worn and lost their full value. The significance of tolerance was that it limited the degree to which the face value of a coin could deviate from the value of the metal contained in that coin. The permissible deviations were usually set as thousandths of the weight of the coin. In Russia, for example, the Mint Statute of 1899 set the permissible deviation for the 5-ruble gold coin, which weighed 1 zolotnik 0.18 dolia, at 0.003. The state assumed costs related to the depreciation of coins within the limits of the permissible deviation. The permissible variations in the dimensions of machine parts. A permissible deviation from a specified value, expressed in actual values or more often as a percentage of the nominal value. The ability of enduring or being less responsive to the influence of a drug or poison, particularly when acquired by continued use of the substance. The allowable deviation from a standard, as the range of variation permitted for the content of a drug in one of its dosage forms. The permissible deviation in a specified size or dimension.